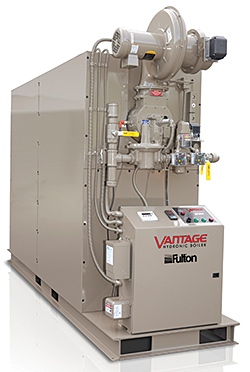 The Vantage series models are available in variations with outputs of 3 million Btu and 4 million Btu. All models are tolerant of varying system conditions. The boilers feature a robust condensing heat exchanger comprised of Duplex alloy steel that offers corrosion resistance and low thermal-expansion rates. High product mass and a large, pressure-vessel, water-volume design removes minimum water-temperature requirements and reduces sensitivity to varying flow conditions.